As a science based organisation we at SAAMBR usually focus on facts and details, we emphasise accuracy and remove emotion, we depersonalise the work and remove the scientist from the science. And these are all good attributes of a scientific paper. BUT when we talk to people – both visitors on-site and off-site we realise that these attributes that are so critical for scientific communication can actually harm our efforts to communicate effectively. People are emotional beings, we thrive on connections to each other, we communicate best by telling stories, not by recounting facts and figures. And as scientists we have a lot to learn about how to tell our stories. 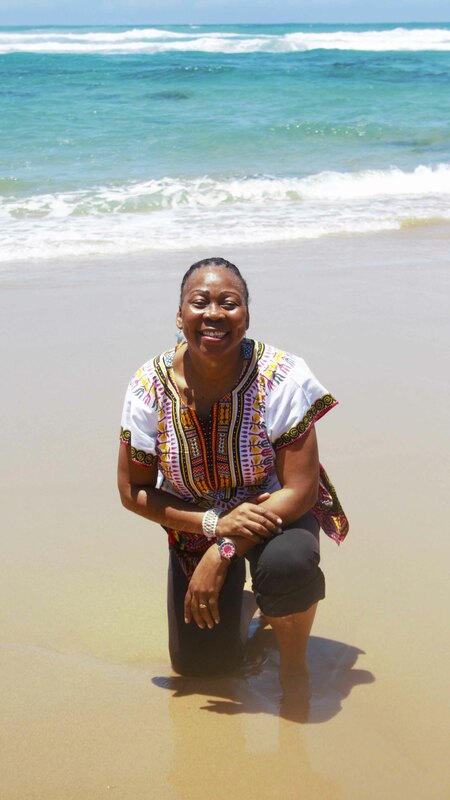 We are therefore delighted to be working together with Dr Gcina Mhlope – celebrated storyteller, actress, poet, playwright, director and author. Storytelling is a deeply traditional Africa activity and Gcina has a special gift to tell stories that are compelling and meaningful, keeping her audiences spell bound as they follow her words through the African veld and across time. Gcina’s stories are told or sung in many of South Africa’s languages, which means that people across the country and the world can join these incredible journeys into imagination. A few years ago Gcina revealed to us her love of tortoises and turtles. 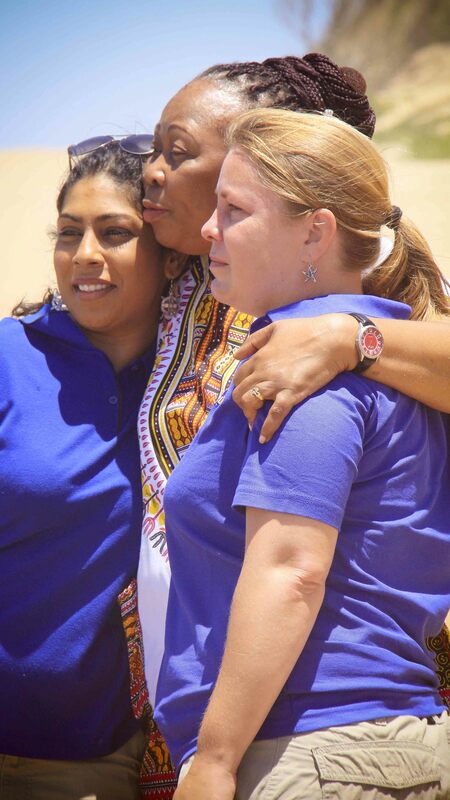 She met a few of our passionate turtle care staff at uShaka Sea World and had a chance to interact with some of the turtles undergoing rehabilitation. When it came time to release one of our loggerhead turtles it was clear the Gcina would be the perfect person to help us to tell our story. 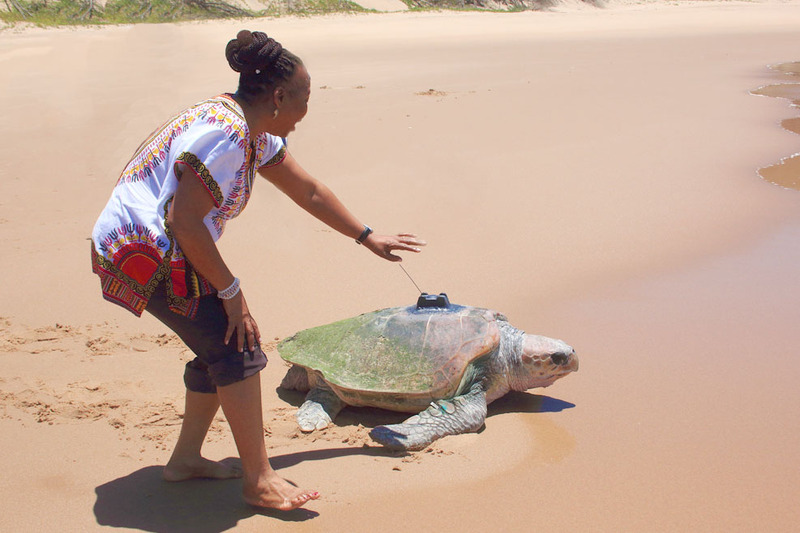 And so Gcina and Herbie, together with a team from SAAMBR, made their way up to Sodwana Bay in iSimangaliso Wetland Park in Northern KwaZulu-Natal. The resultant videos of the release, ably produced by Noel Kok and Pragna Parsotam-Kok of NEWF, clearly show Gcina’s love of nature, and her gift as a story-teller. Watch Part 2 of Herbie’s release video.